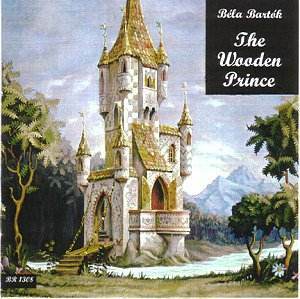 The Wooden Prince, Op. 13, Sz60 (1917). New Symphony Orchestra of London/Walter Süsskind. This is a miraculous discovery. The New Symphony Orchestra of London play with amazing assurance and are accorded a top-notch recording that shows analogue at its finest: warm yet detailed. Booklet notes are refreshingly detailed, even to the extent of including musically-notated quotes to illustrate the progress of the story. The Wooden Prince is a captivating fairytale of magic, princes and princesses. A Prince falls in love on the spot with a Princess, who alas is impervious to his attentions. A fairy puts various obstacles in his path to stop him from contacting his beloved, so he creates a wood copy of himself. It works, and the Princess dances with her toy. But the fairy creates new clothes for the Prince and - eventually - they become a couple and live happily ever after. Bartók�s music in this ballet is powerful and intense (more so than a précis such as that above may be seen to imply, perhaps). It is rarely acidic, often capricious (as in the clarinet�s depiction of the Princess� movements, around 4�00, and her ensuing clarinet-dominated dance) and sometimes plainly and unashamedly Romantic. Bartók�s mastery of orchestration is overwhelming, and Süsskind�s keen ear for balance ensures textures never become crowded. The alertness to rhythm, so vital in Bartók�s music, is no less impressive. The very opening, indeed, shows how multi-faceted this score is. It is at once a magical evocation of a world of the imagination, but the aloof strings evoke not only mystery but also disquiet and even inherent danger. The interaction between the innocence of a fairy-tale and its manifestation as something more horrific provides the basis for Bartók�s realisation. The darker passages of the score (e.g. around 10�40, as the Dance of the Forest begins) are remarkably evocative under Süsskind�s direction, the gestures taken as just that (try the upward swish of the strings at 15�06, booklet quote p.5). Yet the extreme Romanticism of other sections is in no way under-played. The grotesque elements of the Princess�s dance with the �Wooden Prince� is fully brought out in this performance (around 27 minutes in, onwards, including the �dance proper�, around 28�30). The climaxes are magnificently taken - and listen to the comic effect of the contrast of the arrival of the Princess with her dishevelled doll (41�16). Whatever the merits of individual moments (and indeed, of the many marvellous instrumental solos), above all it is the sheer life and vivacity of this performance that makes it so impressive. Boulez (DG 435 863-2) and Dorati (Philips 434 357-2) have oft been cited as the foremost available versions of this ballet. Now another name can be added to the list.